What I have for you today is my easy version of Sri Lankan Shrimp Kottu Roti or Kothu Roti, which is a scrumptious scramble of Spices, Shrimp, Veggies and Shredded Coconut Roti! Hoping y’all enjoy this as much as my daughter and I do! What mac and cheese was to my daughter during her early years was what Kothu Roti was to me during my childhood. Kothu Roti or Koththu Roti or Kottu Roti is Sri Lankan Soul Food. And, just as there are a variety of ways of spelling it, there are a variety of ways of making it. 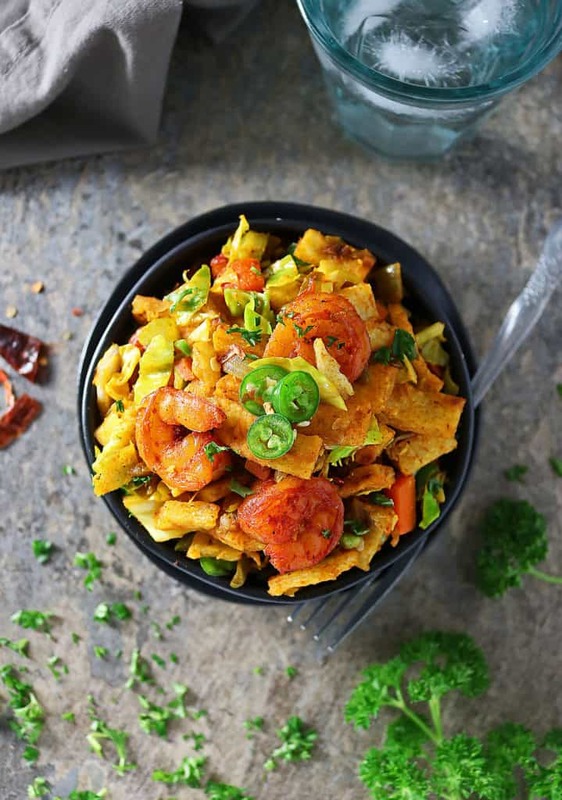 Some Kothu Roti is made with eggs and some sort of meat, other versions are made with just a meat, some are super spicy and some aren’t, some even add in some cheese along with the plethora of other ingredients. My mom would keep it pretty simple when she would make it for us while we were in Sri Lanka; a few veggies, torn up roti, some chicken, and a ton of spices that would have my nose running for hours after! But, that burn was so worth it! When we moved away from Sri Lanka, kothu roti took a backseat for a long, long while – until my daughter and I stumbled on a Sri Lankan restaurant called Kottu House in Manhattan during our New York sojourn last December. We ended up settling on a shrimp kothu while we were there and ever since we got back, my daughter has been going on and on about that shrimp kothu, so, with a little coaching from my mom, I decided to make this version you see here today. This version I have here is pretty simple and not too spicy. 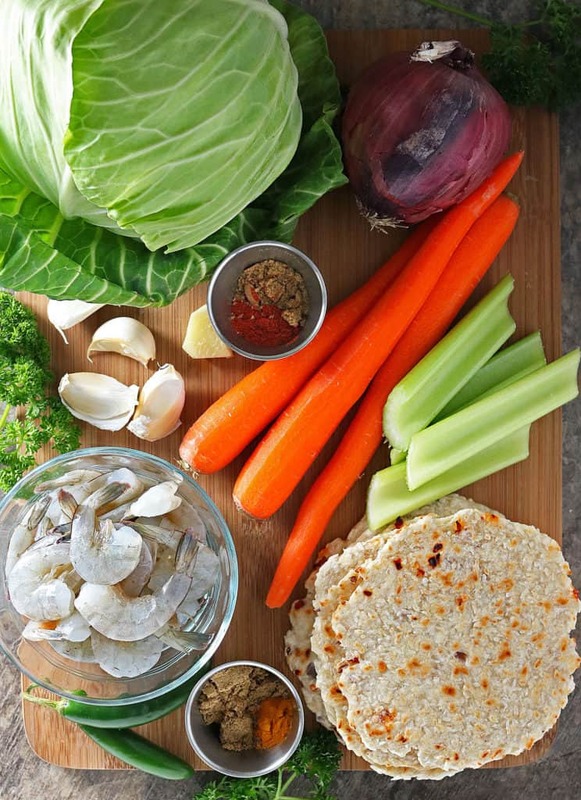 I used the coconut roti I shared here before, only I simply cut it up and mixed it up with shrimp, cabbage, celery, carrots, onions, garlic, ginger and a few spices you can easily find at your local grocery store. I added in some chopped green chilies for a bit of a kick, but they are totally optional. 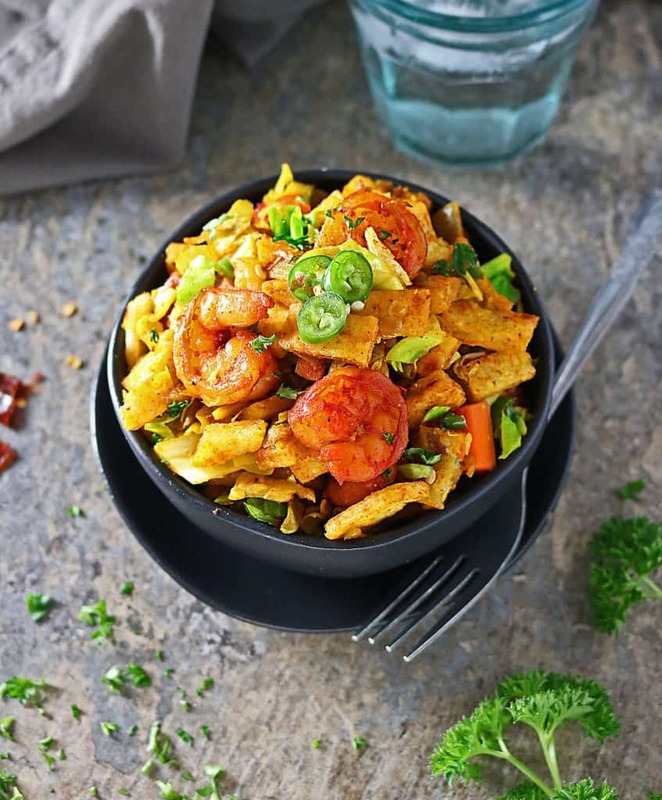 If you are looking for a little variety to spice up your weekend (hoping your mind didn’t venture into the gutter with that) eats, I hope you give this Easy Sri Lankan Shrimp Kothu Roti a try! Till next week, Happy Weekend, y’all! 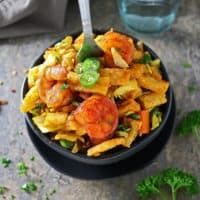 This Sri Lankan Shrimp Kottu Roti or Kothu Roti, is a scrumptious scramble of Spices, Shrimp, Veggies and Shredded Coconut Roti! 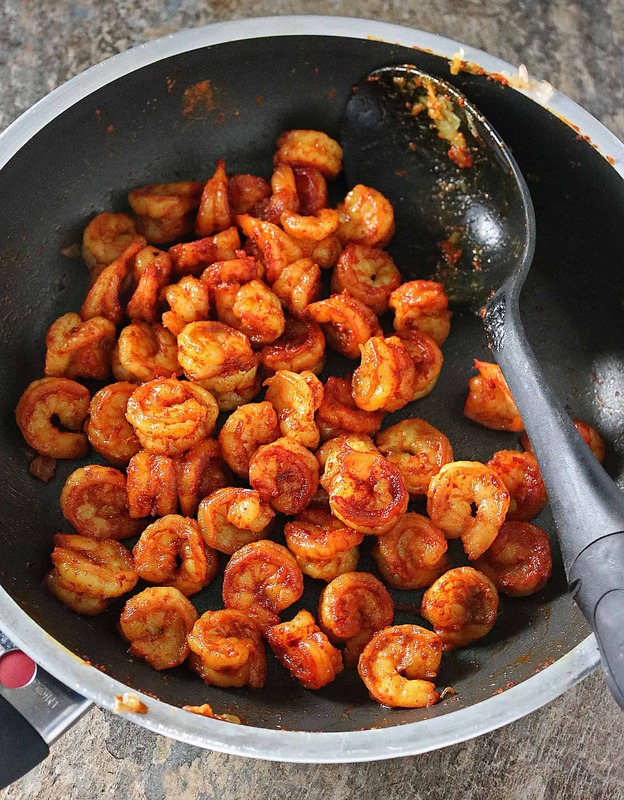 Add 2 tbsp oil to a pan over medium heat and add in shrimp. Then add in 1 tsp paprika, 1 tsp coriander, 1/2 tsp cumin and 1/2 tsp turmeric and saute about 4-5 minutes. Then, spoon shrimp onto a plate and set aside. Add the remaining oil to the same pan (over medium heat) and also add in the onion. Saute onion for about 5-6 minutes, stirring often. Add in the garlic and ginger and saute about 2 minutes. 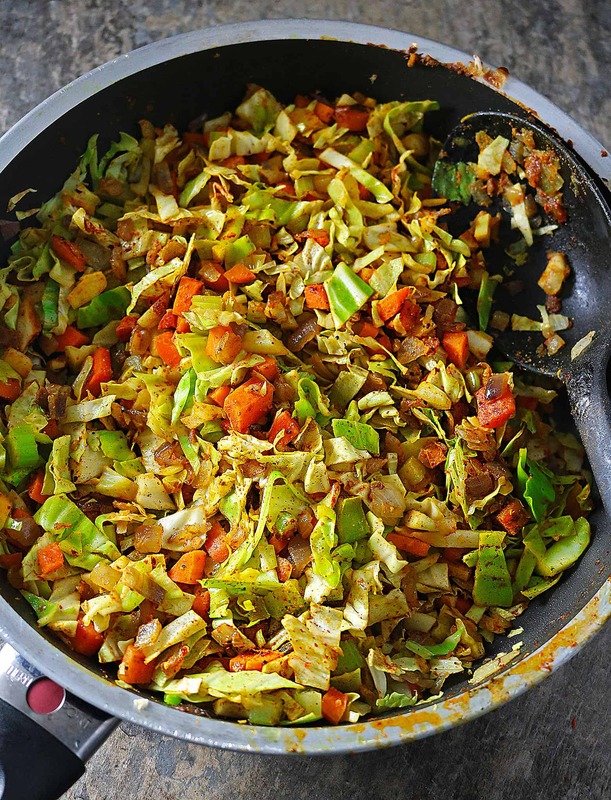 Then add in carrots, celery, and cabbage and sprinkle with the remaining 1 tsp paprika, 1 tsp coriander, 1/2 tsp cumin and 1/2 tsp turmeric, lower heat on stove, and let veggies cook for about 15 minutes covered. 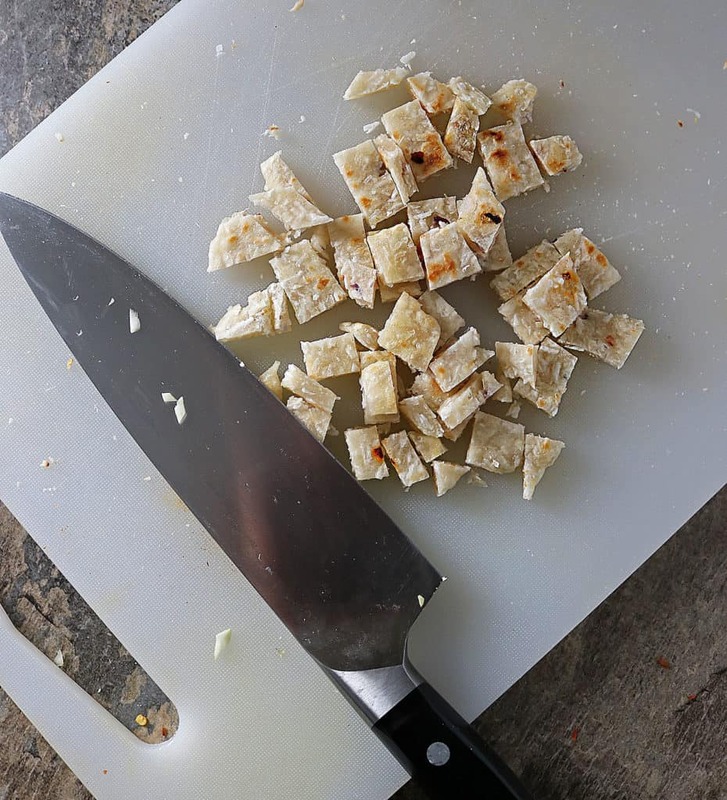 While veggies are cooking, cut up the coconut roti. Also, chop the green chillies, making sure to get as much of the pith and seeds out if you don't want it too spicy and set aside. 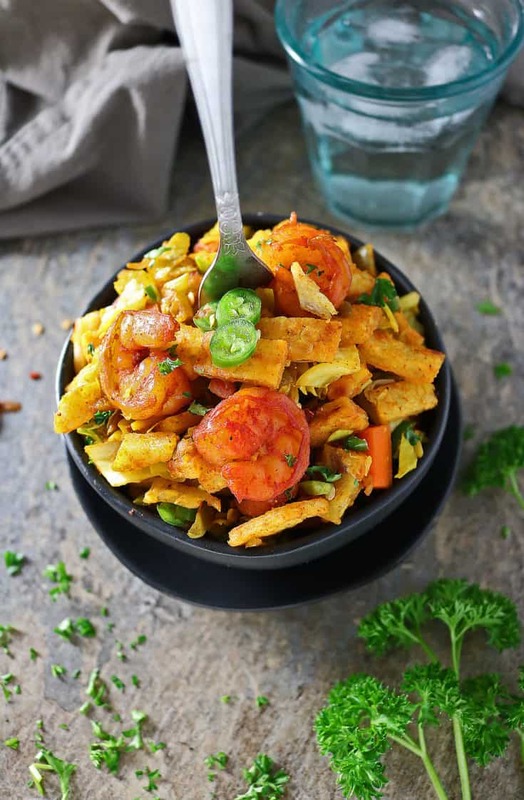 When veggies are ready, add in the shrimp, the cut up coconut roti, green chillies, season with salt and pepper and garnish with chillies and parsley and enjoy warm! I totally want to spice up my weekend 😉 Love this colorful dish! I want to dive into this dish! It looks sp good! This sounds sooooo delicious! I’m all for comfort food and this might be the kind of comfort food I need soon! All those wonderful spices. Your recipe is making me hungry! I’m pinning for later. This looks absolutely delicious. The shrimp literally jump off the screen, I want to eat this! Great flavor combo. Have never thought of using flatbread this way…how fun and delicious with all the shrimp.